E. McCabe, “Archibald McIntyre (Section 9, Lot 1),” Albany Walks for Health, accessed April 20, 2019, http://www.albanywalksforhealth.com/items/show/99. (1) Grondahl, Paul. 2016. “Archibald McIntyre (1772-1858): State Comptroller, Owned Large Iron Ore Mine in Adirondacks.” Times Union. 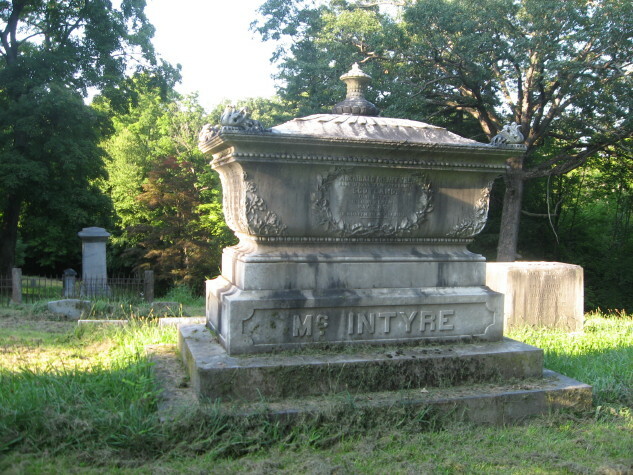 Accessed March 12. http://www.timesunion.com/local/article/Archibald-McIntyre-1772-1858-State-4983393.php. (2) Nelson, Pete. 2013. “David Henderson: The Prince of Adirondac -.” The Adirondack Almanack. July 20. http://www.adirondackalmanack.com/2013/07/david-henderson-the-prince-of-adirondac.html. Fraser, Thomas J. Untitled. Janurary 26, 2012. Accessed March 28, 2016. http://forums.findagrave.com/cgi-bin/fg.cgi?page=pv&GRid=80587249&PIpi=54845717.